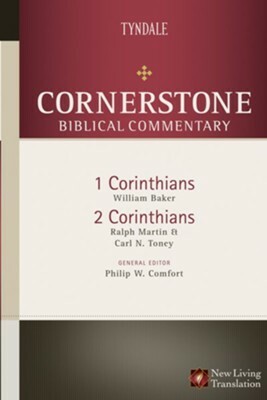 Written by top New Testament scholars, William Baker on 1 Corinthians, and Ralph P. Martin with Carl N. Toney on 2 Corinthians, the Tyndale Cornerstone Biblical Commentary offers the reader an expositional commentary that proceeds section-by-section and is pinned to the text of the New Living Translation. Although not technical, and very readable, it also contains Greek word helps that aid the reader understand the issues and questions that remain in interpreting these important Epistles.Designed to equip students, pastors, and laypeople with up-to-date scholarship in order to better understand and apply every thought contained in God's Word. Explicating Paul's letters to the Corinthians, this accessible resource offers passage-by-passage commentary that explores context, major theological themes, and important interpretive issues; and provides Greek word helps. Based on the New Living Translation. I'm the author/artist and I want to review 1-2 Corinthians - eBook.